Everybody loves pasta right? I presume most people probably eat it at least once a week- 'spagbol' and lasagna?? Standard go to pasta dishes that are probably so far removed from their origins that all that's left is a watery sugar laden (blame Dolmio) bastardised version of the traditional ragu. Its a go to because it's easy to make and everyone loves it. For me though not so much! I've always preferred a drier pasta dish without an abundance of sauce that can sometimes tend to over power the other elements of the dish. 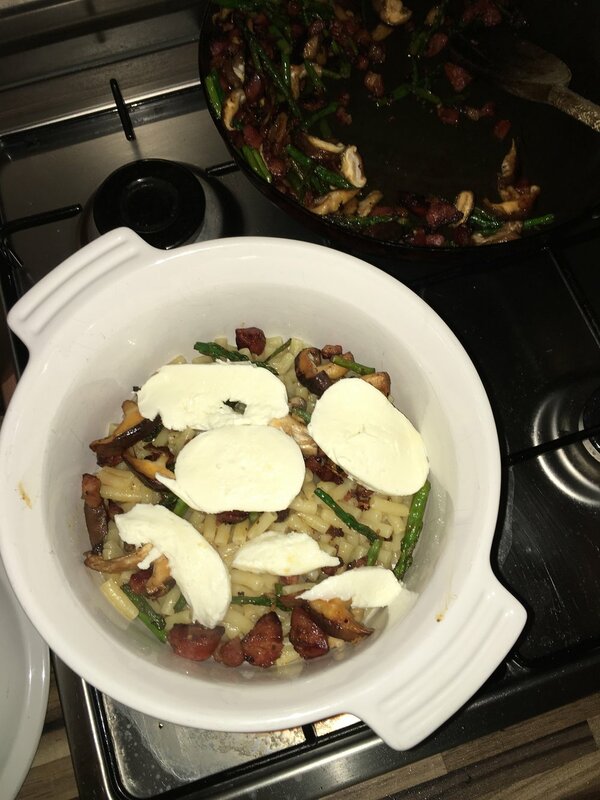 That being said this is a brash, flavourful proper in your face pasta with the earthiness of the shittake mushrooms mixing well with the salty pork of the chorizo and pancetta. Garlic does what it does in many Italian foods and adds depth while the mozzarella adds creaminess and that excellent stringy texture when melted. For greenery I've gone for asparagus and also used Parmesan as in my opinion a pasta dish without Parmesan is tragic. So first add the chorizo to the pan pre-warmed to a medium heat. When you see the oils start to render from the chorizo add the pancetta and turn the hob up to about 3/4. Add your macaroni to the boiling water and ensure you've added about 2-3 table spoons of salt(very important). 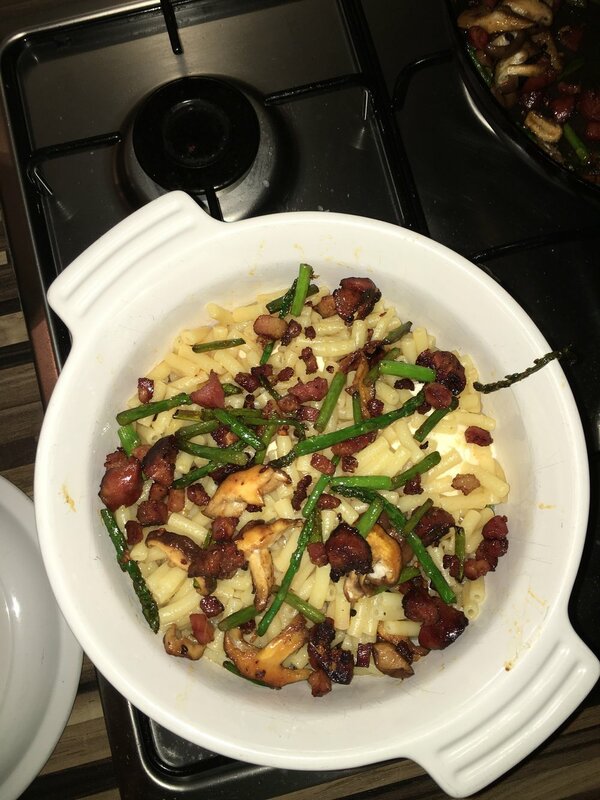 Once the pancetta has started to crisp add the garlic, asparagus and shiitake mushrooms and fry until soft. Check the macaroni is cooked al dente and get out your la creuset. What your looking for is to build up layers so you get the mozzarella and Parmesan melted throughout. 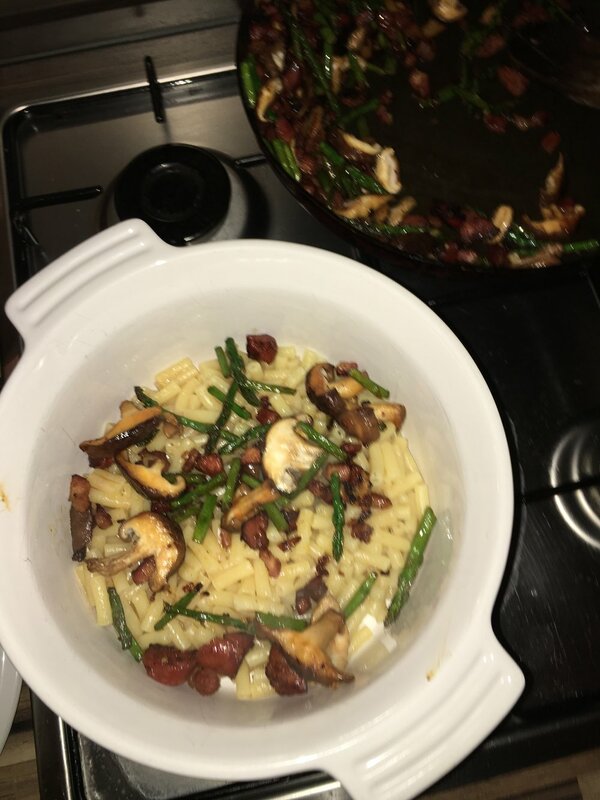 So first drizzle a small amount of extra virgin olive oil on the bottom of your oven dish (which should be pre warmed in an oven at 200) then add the pasta, followed by layers of the chorizo, pancetta, mushroom and asparagus. Sprinkle with copious amounts of Parmesan then add the mozzarella. Repeat this process until you reach the top of your oven dish and drizzle another small bit of extra virgin. Stick on the lid and bake for 10mins at 200 degrees. Ensure you serve on warmed plates with a touch of black pepper and/or chilli flakes!